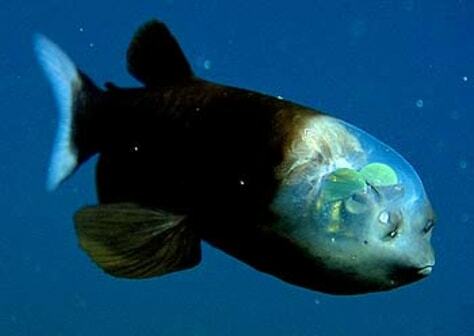 The barreleye (Macropinna microstoma) has extremely light-sensitive eyes that can rotate within a transparent, fluid-filled shield on its head. The fish's tubular eyes are capped by bright green lenses. The eyes point upward (as shown here) when the fish is looking for food overhead.